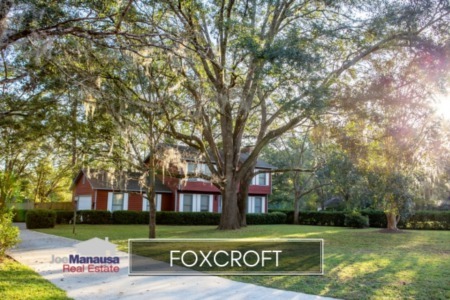 If you have been house hunting along Thomasville Road in Northeast Tallahassee, you likely have been by or near Foxcroft. It is in the heart of the most desired area of town, and it offers homes at prices at and below $200,000 (for now). As you will find in this neighborhood update, there are still some great values to be found in Foxcroft. In this report, we have produced a quick but thorough analysis of home prices, values, and sizes in Foxcroft. 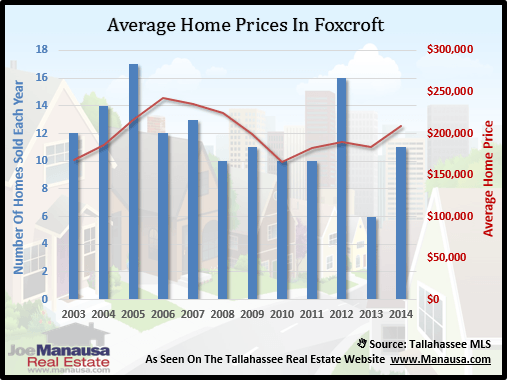 Additionally, you can view the current listings in the Tallahassee MLS and all closed home sales in Foxcroft going back to 2002. For the 3 housing graphs found below, you will find the number of closed home sales for each year (blue columns, measured on the left vertical axis), and an important real estate statistic shown in red (measured on the right vertical axis. Home prices rebounded strongly in 2014, with average prices up 14% over 2013. 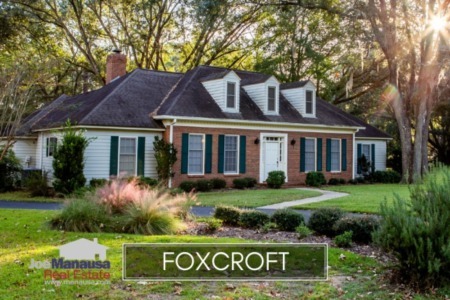 The average recorded sales price was $209,500 for Foxcroft in 2014. The number of closed home sales in 2014 was consistent with what the neighborhood has been seeing since 2006. There were 11 closed home sales in Foxcroft in 2014 and one so far this year. 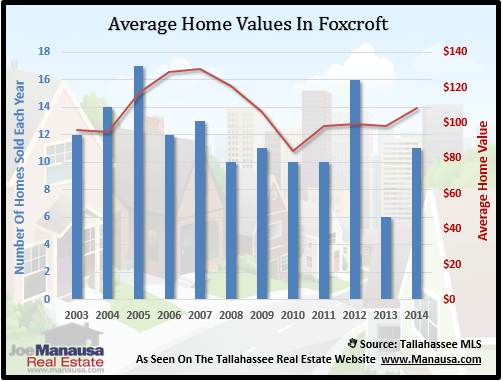 Average home values in Foxcroft rose in 2014 after recording a small decline in 2013, and they currently are substantially higher than the 11 year low established in 2010. While there has only been one home sold and closed in Foxcroft thus far in 2015, it was for $116 per square foot. The average value of a home sold in Foxcroft last year was $108 per square foot. 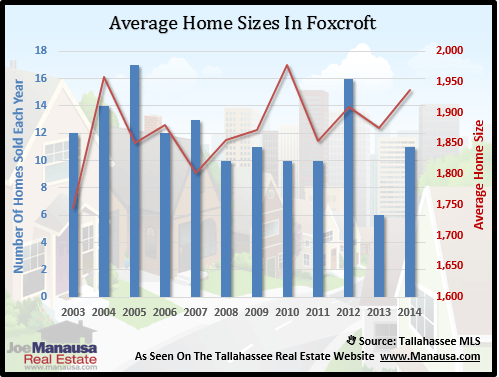 The average home size sold in Foxcroft typically falls in a range of 1,800 to 2,000 square feet, and this year is no different. The 11 home sales in 2014 averaged 1,936 square feet, meaning buyers are choosing the larger homes due to cheap money and great values in the neighborhood. The following list of homes are the most recent listings in Foxcroft. The following list shows home sales going back to 2002 in Foxcroft. I hope you enjoyed our February 2015 update on home sales in Foxcroft, please feel free to drop me a note if you have questions not covered in this report.